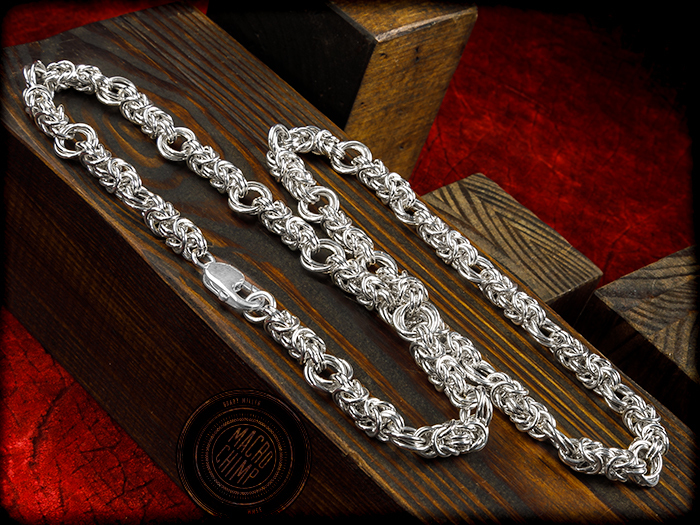 Handmade by NRA Past President Sandy Froman, this 24-inch Chain Maille Necklace is executed in Argentium sterling silver wire woven in the Byzantine Flower pattern and finished with a secure Sterling Silver Lobster Claw clasp.. This beautiful necklace is casual and elegant at the same time; it pairs equally well with blue jeans or an evening gown. Chain maille jewelry begins with wire that is coiled around a mandrel and then saw cut along the length of the mandrel to make individual round jump rings. The rings are smoothed and polished and then woven together by hand with jewelry pliers to create a particular weave. Each jump ring was opened and closed by hand using smooth-jawed jewelry pliers. Argentium Sterling Silver is sterling silver in which some of the alloy (usually copper) is replaced with Germanium, resulting in sterling silver that has a significantly higher tarnish resistance than ordinary sterling. Click here to read the Ring of Freedom article "The Chain Maille Art of Sandy Froman." Sandy Froman was President of the National Rifle Association (“NRA”) from 2005-2007. She has been a member of the NRA Board of Directors since 1992 and was elected as Vice President in 1998 under President Charlton Heston, serving as an officer of NRA for nine years. She has chaired six NRA committees, including the Legislative Policy, Grassroots Development and Ways and Means Committees. Upon finishing her second term as NRA President in 2007, Froman was unanimously elected for life to the NRA Executive Council by the NRA Board of Directors. Froman received her undergraduate degree in economics with honors from Stanford University and her juris doctor degree from Harvard Law School. She has been a partner at prominent law firms in California and Arizona. Recognized by her peers in the publication Best Lawyers in America, she practices law in Tucson where she represents clients in business and litigation matters and also serves as a mediator and arbitrator assisting other lawyers and their clients in resolving cases without trial. A past President and former Board Member of the Arizona Bar Foundation, Froman is also a Charter Member of the Tucson Chapter of the Federal Bar Association and a James Madison Member of the Federalist Society. She has been recognized by both the American Bar Association and the Pima County Bar Association for exceptional contributions to the delivery of pro bono legal services. From 1983-1985, Froman taught law as a full-time law professor at Santa Clara University Law School in California. She currently serves on the advisory boards of the University of Arizona James E. Rogers College of Law in Tucson, Arizona and the George Mason University Law School in Fairfax, Virginia. Froman co-founded the National Firearms Law Seminar, now in its 15th year, which trains attorneys on legal issues relating to Constitutional Law and the Second Amendment, and federal regulatory issues, particularly relating to firearms, hunting and conservation. An international speaker on the right to keep and bear arms, Froman has represented the NRA in its capacity as an NGO at the United Nations. She promotes the NRA as a civil rights organization, dedicated to the protection and advancement of the Bill of Rights to the United States Constitution. In today’s complex and uncertain world, the Second Amendment is an insurance policy for America’s civil liberties-the one right that protects all the others. An NRA-certified instructor, Froman promotes firearms education, safety and marksmanship training for all peaceable Americans, especially women, minorities and youth. A native of San Francisco, Froman didn’t grow up in a hunting or shooting family but she has become an avid sportswoman as an adult. She enjoys shooting pistols, rifles and shotguns, and has hunted numerous species in ten states in North America and on three continents. In 2008 the was named SHOT Business Person of the Year for leadership in the shooting sports industry in preserving and promoting America’s hunting and shooting heritage. Froman has been active in state and national politics for 30 years and has worked on state and federal election campaigns and legislative projects. She works to expand right-to-carry laws that permit peaceable, responsible, law-abiding citizens to use, possess and enjoy their private firearms. Among her many legislative accomplishments, she was instrumental in the successful grassroots fight to pass Arizona’s Right to Carry law in 1995, passage of firearms preemption in Arizona in 2000, and enactment in 2009 in Arizona of a record seven new pieces of pro-gun legislation. In 2008, she testified before the Judiciary Committee of the United States Senate in opposition to the confirmation of U.S. Supreme Court Justice Sonia Sotomayor based on her record of antipathy to the Second Amendment. Froman is a Benefactor member of the NRA and a member of the NRA Ring of Freedom. She supports diverse shooting and hunting organizations: she is life member of Safari Club International, the Arizona State Rifle and Pistol Association, the California Rifle and Pistol Association, the Indiana State Rifle & Pistol Association, the Texas State Rifle Association, the Single Action Shooting Society and the Pima Pistol Club. She is also a member of the Ohio Gun Collectors Association, the American Society of Arms Collectors and the Fifty Caliber Shooters Association. Froman has served as a trustee of The NRA Foundation, NRA’s charitable affiliate, for 14 of the past 18 years and was the Foundation’s second president. She also served for six years as a trustee of the NRA’s Firearms Civil Rights Legal Defense Fund, which provides financial support for legal cases involving the right to keep and bear arms. She is most pleased to have sponsored the permanent Law Enforcement Exhibit at the NRA’s National Firearms Museum, in memory of her late husband, Bruce Nelson, a career law enforcement officer. Sandy also serves as chairwoman of the Joe Foss Institute, which is dedicated to promoting and teaching patriotism, public service, integrity and an appreciation for America’s freedoms to our nation’s youth. Froman’s numerous television appearances include Good Morning America, CNN 360 with Anderson Cooper, ABC World News Tonight, MSNBC and Fox and Friends. She has been featured in countless newspaper and magazine articles in the U.S. and internationally, including a positive story about firearms ownership that appeared on the front page of The New York Times entitled “The Gun Culture: Fun As Well As Life and Death”. Froman didn’t shoot her first gun until she was in her early 30’s. However, she favored knives from an early age and used her grandfather’s pocketknife to whittle balsa wood kite frames into bows and arrows for hunting tomatoes in her mother’s garden. Her love for knives was discouraged by her mother, but encouraged 25 years later by her late husband Bruce, who was a member of the American Bladesmith Society and studied knifemaking with Bo Randall and Dan Dennehy, and from whom she inherited a Randall knife, among a host of blades. Currently, her favorite custom knives are by two knifemakers with completely different styles: Jim Crowell and D’Alton Holder. Froman was the first Cornerstone Charter Member of Knife Rights. She believes that rights that are not exercised cease to exist, and so carries her knives as well as her guns, wherever the law allows.